Here is a little bit about my Sweetie Pie. What follows is what flowed out… I just wrote… I tried to give you an overview, and it still isn’t even a fraction of who she was. There will never be another quite like her. I loved her so much. Sweetie Pie passed just after Thanksgiving, November 29, 2010. She was 12-1/2. I adopted her right off the Miami track during a “clean-out” of the kennel and we picked her up from the hauler truck at a stop on Interstate 275. She was 5. She was a kennel favorite and ran 181 races. I suppose she made someone a lot of money. She was meant to go to a brood farm, but the kennel manager snuck her out, bless her. Sweetie Pie’s real life began that day when she was 5 years old and we first saw each other’s face. I fell instantly in love with this tiny bundle of energy and joy. She was funny, happy, curious, and had a sense of humor that I have never seen in another dog in all my life. She was my little ray of sunshine, no matter what kind of day I was having, she could make me smile, and most times, even laugh out loud. She and I grieved our Bandit together when he passed at 8 from osteo. I somehow always knew she would be with me for longer. I feel like she knew I needed her. When she got cancer herself at 12, she was amazing, always upbeat even through surgery and three chemo treatments. She would have continued on even after she relapsed if I had asked her to, but I knew it was time for me to do the right thing for her and let her go. For the first time ever, I looked at her and knew that she was tired. She had given so much for so long, I just couldn’t ask for more. She took a huge part of my heart with her when she left and I still miss her every day. But she also left me with the many lessons she taught me, to laugh in the face of adversity, to enjoy the sun on a warm day, and to be love with all your heart. She was all that and so much more. I know that she is safe with Bandit now. One day after she left he let me know that he had her. That was a huge relief and I cried and cried. The house felt so empty after my precious girl was gone, even with Joe and Dodd there, and I think they felt the same way. She was a huge presence in a tiny body, and will be deeply missed by all who knew her. Slowly but surely I am starting to smile more than I cry when I think of her. She was my girl, my little lady, my precious princess, my constant companion and my snuggle bug every single night of our lives together. Life just won’t be the same without her, but we are all better for having known her. My Sweetie Pie. My girl. My heart. You mattered. I loved this, even if it did almost make me cry. =) I can only imagine how much you must miss both of your pups. One of our dogs is a Greyhound mix and he is our “Old Man” who still jumps fences to catch squirrels! I hope you find peace over time. We love and value our pets so much, as they are so great to us! Thank you for sharing. That is just absolutely beautiful. What a wonderful tribute to Sweetie Pie. I think Berry may have met a friend on the Bridge. Thank you for sharing such a poignant story of her. I did cry. Ours didn’t leave us too many months apart, so I do feel your pain, your sorrow and your longing. Smiles become easier when you have others in your life. Joe and Dodd will help. We had the honor of having Miss Sweetie Pie stay in our home with Cyndi, Dodd and Joe for an overnight. To know her was to love her, believe me. 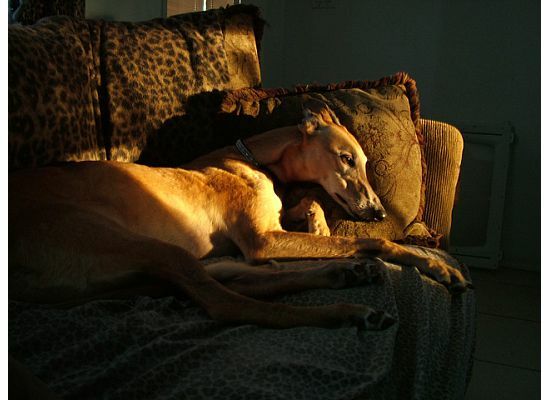 Without any sound or any action, she quietly assumed top dog status over the 5 other greys we had together. And then she promptly took a nap, using our Flex’s head as an ottoman. He loved it. I miss her too, Cyndi, and I miss her for you. Sweetie Pie gave two gifts – the first was the love you had for each other, and the second is that she would want you to love others as you did her.